Growing road networks, expansion of highways, upcoming infrastructure projects along with rising foreign investments are some of the key factors which have fuelled growth of the Latin America Asphalt Paver Market. Further, government policies on infrastructural development by using Public Private Partnership (PPP) Model have resulted in wide utilization of asphalt pavers in the road construction industry across Latin America. According to 6Wresearch, Latin America asphalt paver market size is projected to grow at a CAGR of 4.8% during 2017-22. In 2016, tracked pavers accounted for highest volume share in almost all the countries across Latin America, with hydrostatic technology being the primary choice of contractors. During 2017-22, the market for tracked paver is further expected to grow on account of higher traction and greater stability. On the other hand, wheeled pavers are used in areas where higher mobility is the key concern of the project development. Amongst all the countries, Mexico and Brazil captured majority of the Latin America asphalt paver market share and is likely to dominate the market during the forecast period as well due to growing investment in roads & highways. Other countries which are expected to drive the Latin America asphalt paver market during the forecast period are Argentina, Colombia, Chile Peru and Panama. The Latin America asphalt paver market report thoroughly covers the market by types, by technologies, by paving width and by countries. 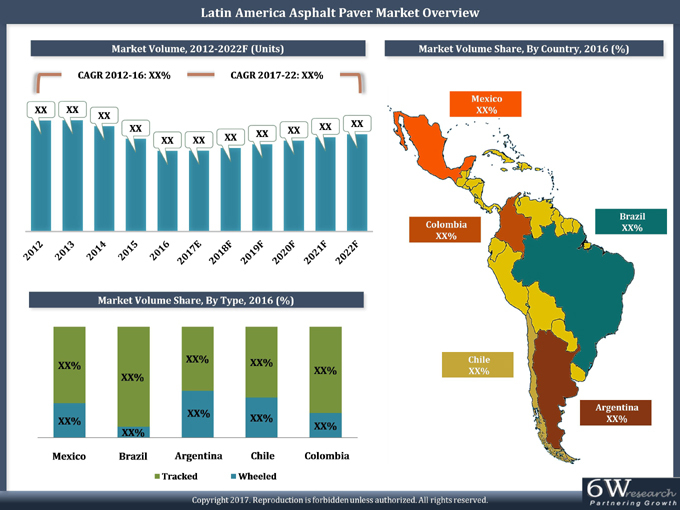 The Latin America asphalt paver market outlook report provides an unbiased and detailed analysis of the Latin America asphalt paver market trends, opportunities/high growth areas, market drivers which would help stakeholders to device and align their market strategies according to the current and future market dynamics.